2009 January | Affordable letterpress stationery that is artistic, charming, elegant. I am glad I live in Colorado. I am glad Doug took me to the Fire Station. I am glad Denise came back. 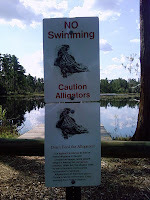 Wags to all and be careful if you venture to Florida. Happiness to me is a good hike with good humans, that was today. My human friend Mary, massage therapist extraordinaire, sailor, and all around doggie person came with us. My goal was to just run, run, run and run some more. Denise and Mary kept up with me, but talked a lot! I learned about the Aspen Club, that provides a wide range of health education, screenings, hospital discounts, and social opportunities to residents from Fort Collins, Loveland, Windsor, and surrounding communities. If your a human, check it out, it’s FREE!/shop. Maybe when I am older I can join a Golden Retriever Paw Club, a doggie group that goes out on walks with our humans and our tennis balls because that is what Happiness Is All About. But for today running on the Michaud Lane Trail, part of the Reservoir Ridge Natural Area was a 10 on the dog bone scale. Tail Wags To All and enjoy a good walk. Today Denise received the Stephen Huneck newsletter from Dog Mountain News. 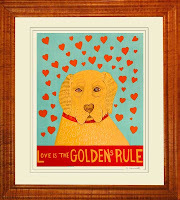 If you live with a golden, you know goldens are sensitive souls, loyal and empathitic who exude love from every fiber of their being. Sweetness is their middle name. I guess I have another middle name now, but you can call me Moose! Tail wags to All for a day full of tennis balls. I am Moose the CabinPress Studio dog and welcome to my blog. The world has gone to the dogs…literally, hee, hee. I hope to entertain you with “tails” of my adventures in my home state of Colorado and beyond — once I get the hang of typing. When everyone meets me they always seem to comment on my Paw Size. Paws are a little big for the keyboard (note to self, develop dog keyboard, make millions, by acres of land to house tennis balls on.) I came to live with my owners Doug & Denise in August 2008, when they adopted me from my kennel. My kennel days are over and now I live the good life in Fort Collins, Colorado. I work at CabinPress Studio. My job is to look cute and get lots of pets, which I am good at. I have mind control over humans…”I am cute, pet me, you can not resist!” …works everytime. 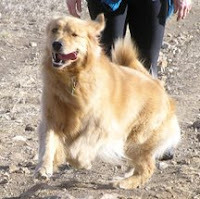 Anyway, I hope to post some interesting photos and maybe some insights into a Golden Retriever’s life. I hope you check my Blog often to see how I am doing, I will be around for a long, long time!